i've said it before, and it seems i have cause to say it once again; cycling must surely be one, if not the best provided for activity when it comes to choice of apparel. in my early days on islay, i thought it necessary to acquaint myself with the availability of specifically outdoor clothing, the sort of garmentage that would keep me warm and dry in the face of north atlantic adversity. this had less to do with the need to cycle all year round as it did with my vain attempts to fashion myself as a landscape artist. 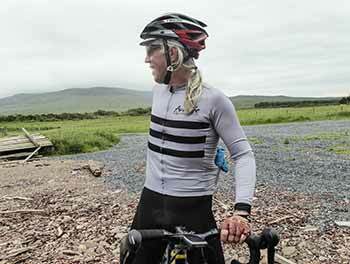 you will all well know of the internal warmth that can be achieved when cycling, even at a sedate pace, but sitting for hours in remote locations during the winter months will rob even the most active cyclist of the majority of that heat. the search, therefore, was on to find breathable jackets, insulated trousers, waterproof overtrousers and appropriately constituted woolly hats to make the act of scribbing charcoal on paper a tad less iniquitous than it would otherwise have been. however, i'd be fibbing if i didn't admit to at least a modest desire to appear as outdoorsy as the pages of several of the (pre-internet) catalogues made it appear was a prerequisite of the genre. though there still exists an internal artist, the external expression of this has long since flown the coop. however, since those early nineties days, garment technology has moved on considerably. despite global warming, sitting on the council isle at finlaggan in mid january is every bit as cold as it has ever been. the activity of cycling has arguably outrun that of long walks in the country, or hiking up the side of tall mountains. granted, there are still those intent on exploring the more obscure corners of antarctica and their clothing needs will forever be more demanding than the sunday morning peloton. but that has not put paid to a continuous momentum to satisfy the needs of the velocipedinist even to the extent of giving him or her stuff they hadn't even realised they needed in the first place. 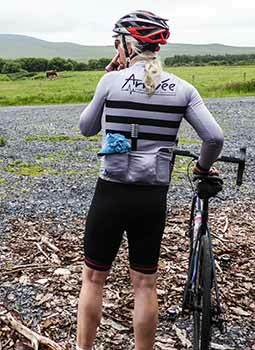 new to me at least in the cycle clothing market, is cheshire based arrivée performance clothing, the brainchild of former dave rayner fund and gb cycling rider, mark baker who gained some professional success in europe during the late nineties and early noughties. pursuant to my contention that the cycle clothing market was all but saturated, i asked him why he'd decided to put his toes in the water (so to speak)? "I prefer to think of the market as competitive rather than saturated. It's true there are many new brands appearing, however I'm going to try and offer value and experience to our customers. "Many new cyclists need guidance and advice on aspects of cycling and the vast majority of online and offline retailers just sell the kit and send them on their way." 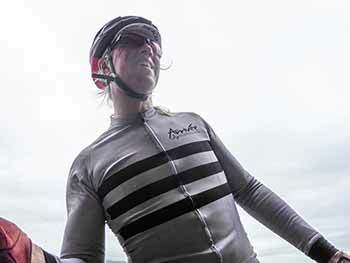 as with yanto barker's le col clothing, it's not unheard of for former pros to apply their experience in favour of providing cycle clothing that bridges the gap between the amateur and the professional. with this in mind, arrivée sent me a long-sleeve intermediate jersey for review that might better demonstrate the quality of their wares. the latter seems quite extensive for a company that only arrived (pardon the pun) at the marketplace under a year ago and which features of both men's and women's ranges consisting of more than just a handful of competitively priced jerseys and bibshorts. 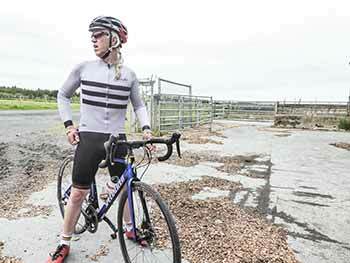 along with the upsurge in availability of cycle clothing has come the distinction between regular and race fit. the former tends to be a little less figure hugging and tolerant of the less than svelte figure. it also has the useable advantage of not making the wearer look like a refugee from the peloton. the race-fit genre mostly consists of jerseys that feel less than comfortably tailored while stood in front of the bathroom mirror, yet magically transform into a second skin the moment those arms reach for the brake hoods. arrivée's intermediate jersey, drawn from their national range features a neutral grey augmented by three horizontal black hoops and black cuffs. the hoops appear on both front and back. disappointingly, from my point of view at least, across the upper back, above the hoops appears the legend 'arrivée performance clothing' writ large. this also appears in smaller form on the front left along with apc at lower front right and on the leftmost rear pocket. i could live with the the latter and on the left breast, but the rest, especially the large wording on the rear, seems a tad unnecessary. it's one thing to feature the club or sponsor name on a jersey, but this seems like branding overkill. a superficial point i agree, but one i feel compelled to make nonetheless. your mileage may vary. but to return to the race-fit aspect, arrivée's almost seems to work in reverse. though the medium-sized jersey reviewed was a very close fit (i was advised that this range tends to come up a little smaller than normal), i had no complaints on that score whatsoever. but while all felt perfectly normal in front of that well-used bathroom mirror, there seemed a little tightness across the shoulders when in attack mode on the bike. oddly enough and most welcome, in practice this made not one whit of a difference when riding; in fact the jersey behaved impeccably even when its wearer didn't. in common with most quality jerseys, the intermediate offers a full-length front zip with zip garage at the top, along with the usual three rear pockets and a fourth, zipped security edition. sadly, those pockets were a bit shallower than required by the contemporary pelotonese. i struggled to stuff a rolled up rainjacket into one of the outer pockets while the length of a mini pump was more out than in. however, it would be unfair to single out arrivée as the sole practitioners of this minor inadequacy as i have several other jerseys with a similar problem. all disparaging aside, if viewed as such, the arrivée intermediate jersey was remarkably comfortable, more breathable than i'd expected and quite frankly, a joy to wear. but with the bulk of the arrivée ranges being relatively new to the world, i also asked mark what plans he had for the future? "I plan on doing tutorials, events, Q&As with professional riders to pass on their and my experience. For me it's all about adding real value to people's lives and helping people. "At present, I'm reaching out to people I know and trying to make connections to facilitate the above." the long-sleeve intermediate jersey is available in sizes ranging from small to xxxl, but you might wish to consider moving up a size from your usual fit, as they are of a commendably close fit. the jersey is also available in black with white hoops and both retail directly from the arrivée website for a most amenable £84.99.